Nestled in Italy’s Chianti region, among the rolling hills of Tuscany, is an Italian castle offering 5-star accommodations with a perfect balance of Old World charisma and modern comforts. Castello Del Nero, the restored country home of a 12th-century Nobleman who rubbed elbows with the likes of Machiavelli, welcomes guests with luxurious accommodations that retain the style and flavor of the early Renaissance era. Only two families, the Del Nero and Torrigiani, have owned the 740-acre estate. In 1986, international real estate developer Robert Trotta purchased Castello Del Nero, converting it to the world-class hotel, it is today. The work was done under the guidance of the Italian Fine Arts Commission to ensure the cultural preservation and authenticity of the finished project. The result is a beautifully restored landmark with the appearance and authentic feel of the 12th-century. Many original details are preserved, like the commanding clock tower, or the rustic wooden doors that lead into the lobby where grey stone lines, still visible in the original floor, once guided carriages into the atrium. The only new structural addition is the rear terrace that overlooks the beautiful Tuscan countryside. 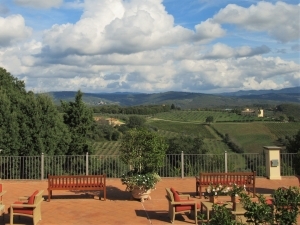 The estate’s olive grove and vineyards produce extra virgin olive oil and two red wines for the hotel’s use. 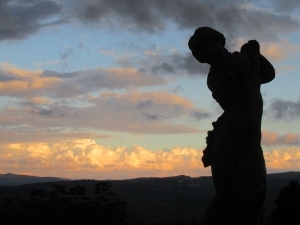 The terrace, with its fine Italian statues silhouetted against the evening sky, beckons guests to watch the sun set behind the distant Tuscan hills and toast the day’s end with a glass of locally produced Chianti. The hotel is a perfect mix of Old World charm and modern comforts. Creative solutions are employed to ensure the castle’s original art and architecture are preserved. Many of the 18 luxury suites feature unique H-shaped bathrooms designed to preserve the original frescoes that cover their ceilings. The 50 single rooms, which are in separate buildings from the main castle structure, were also created to reflect the colors and styles of the 12th-century Italian countryside while providing guests with modern comforts. Warm, traditional Tuscan colors and floral patterns beneath oak-beamed ceilings create an exceptional experience no matter what type of room is enjoyed. Every bathroom features a clawfoot tub, with a separate shower. In many of the rooms, as well as other hotel spaces, original antiques and furniture are still in use. The lights, activated by the room’s electronic key, turn off when the room is unused to save electricity. Every guest room has TV available, and Internet access is reliable throughout the hotel. Below the main lobby, the hotel’s Bar and the La Taverna restaurant occupy the space that was once the castle’s kitchen. La Taverna provides casual dining with authentic local dishes and wines from the collection of more than 1100 labels found in the castle’s original 12th-century wine cellar below. Down a short hallway, La Torre, with its Michelin starred cuisine, features a more formal menu of seasonal gourmet dishes made with fresh herbs and vegetables grown on the estate. Guests can experience some of Italy’s finest cooking, surrounded by original antiques and the restored crests from the Del Nero and Torrigiani families. The hotel offers more than dinner and overnight accommodations. The grounds feature tennis courts, a heated pool, and color-coded walking trails from 1 to 10 miles in length where visitors may encounter wild boar, deer, fox, and pheasants. For those who wish to be pampered, a 10,000 square foot facility presented by world-renowned spa provider, ESPA, awaits hotel guests with hydrotherapy rooms, an arctic fountain, and a sauna with an all-glass wall that makes a spectacular Tuscan view part of the relaxing treatment. Massages feature the estate’s own seasonal ingredients, such as virgin olive oil, rosemary, and lavender. Beauty services are also available, as well as specialty and couples’ treatments. 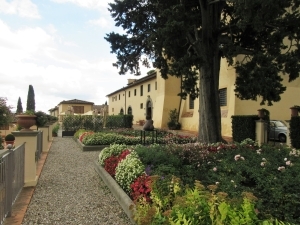 Castello Del Nero is a short drive from the historic attractions, fine dining, and local shops in Florence and Siena, which are accessible by complimentary hotel shuttle several times a week. More adventurous guests can rent a vintage Fiat 500 or Vespa scooter and tour the countryside, or take in the scenery from a hot air balloon or helicopter. From the moment you pass through the Italian Garden near Castello Del Nero’s entrance, to your first taste of Michelin starred dining at La Torre, to your last evening watching the sunset from the terrace, your connection with the Old World castle is perfectly complemented by the comforts and world-class service of this modern-day luxury hotel. It’s easy to see why most guests are repeat customers. 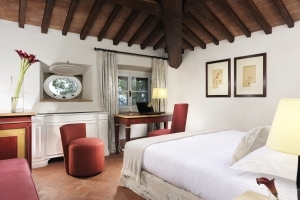 The hotel’s Renaissance charm, authentic local tastes, and 5-star comfort will stay with you long after Castello Del Nero’s clock tower fades from your view.